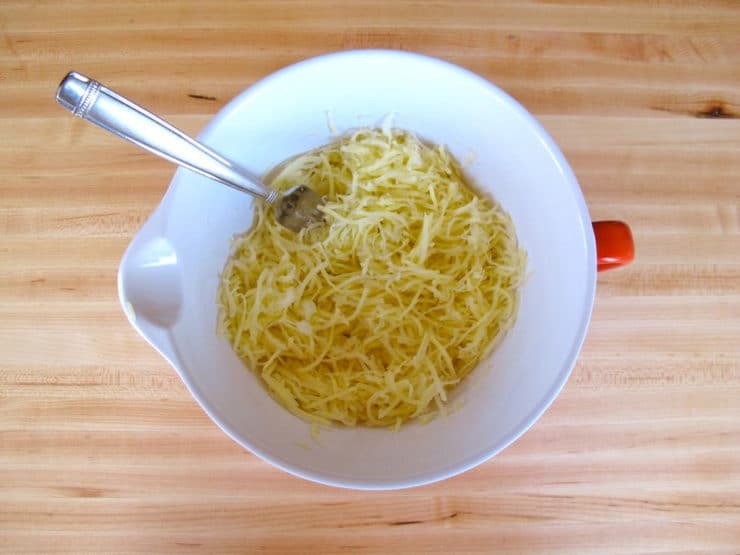 Making latkes gluten free is a lot easier than you might think. Most latkes are made with matzo meal or breadcrumbs to bind them, but these Gluten Free Crispy Yukon Gold latkes are totally grain free. They are every bit as delicious as traditional latkes, without a trace of gluten. Golden, crisp, fluffy inside and scrumptious. What’s not to love? 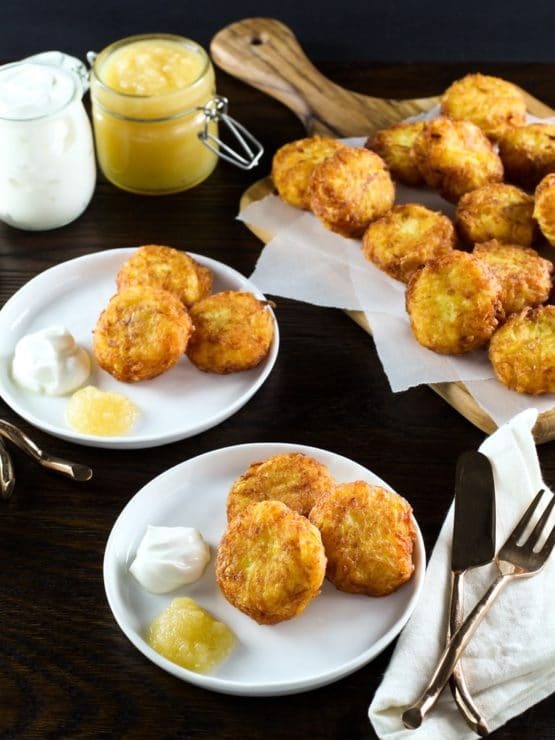 These crispy little potato pancakes are the ultimate crispy, delicious, melt-in-your-mouth latkes. Follow the steps carefully (don’t skip anything!) and you’re sure to end up with latkes that will please even the pickiest bubbe. 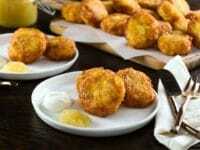 I made these mini latkes using Yukon Gold potatoes. They have a slightly creamy, rich flavor and they crisp up beautifully when fried. I omitted the matzo meal that is so often added to the potato batter. While breadcrumbs or matzo meal can be helpful, you don’t really need these ingredients to bind latkes together. Potato starch adds an extra bit of binding power. One of the most difficult parts of cooking latkes is controlling the oil temperature. 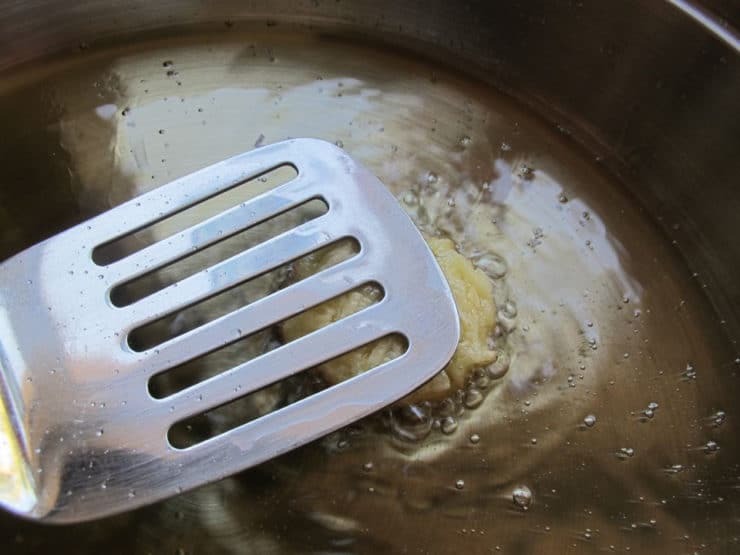 The best oil temperature for frying latkes is around 365 degrees F. If the oil becomes too hot, they burn. If the oil is not hot enough, they soak up too much oil and become soggy. An electric skillet with a temperature control gauge that will keep the heat even and steady. You can also use a candy thermometer to test oil temperature regularly throughout the process. When the oil is just right, it binds the latkes the minute they hit the oil. The real secret to these latkes is the size. I only use about a tablespoon of potato batter for each latke. The smaller size allows them to cook up crispy and hold together better than larger latkes. Because they are small, they cook faster and require less oil. Their miniature size also makes them an irresistible bite-sized treat! 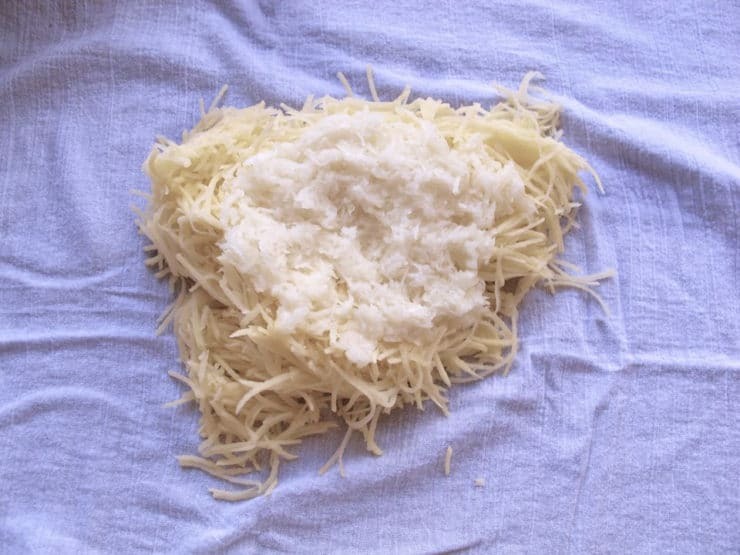 Make sure you grate these latkes fine with the small holes of a grater or food processor. 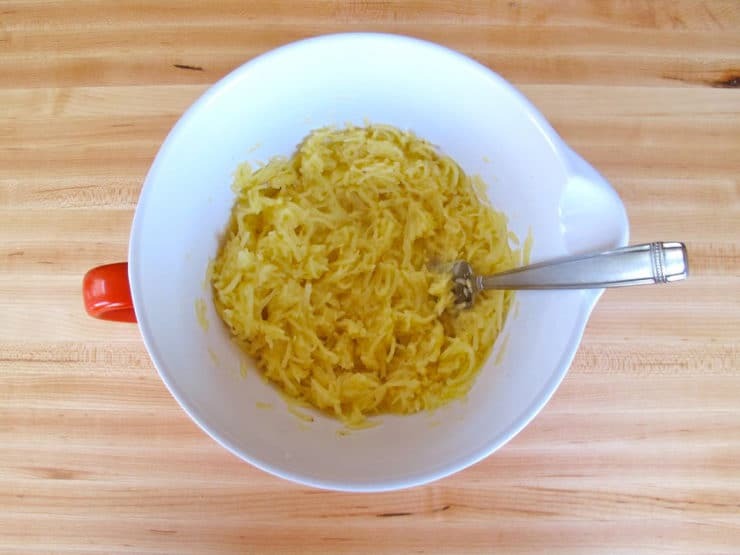 Larger shreds won’t hold together as well, which may necessitate having to add more eggs, matzo meal or flour to the mix (don’t do that if you’re keeping them gluten free!). I know latkes are a Hanukkah food, but you can easily make them kosher for Passover by using a Passover approved cooking oil (like extra virgin olive oil). Olive oil has a lower smoke point than peanut, so watch the temperature carefully to make sure the oil doesn’t become brown/smoky. Enjoy! 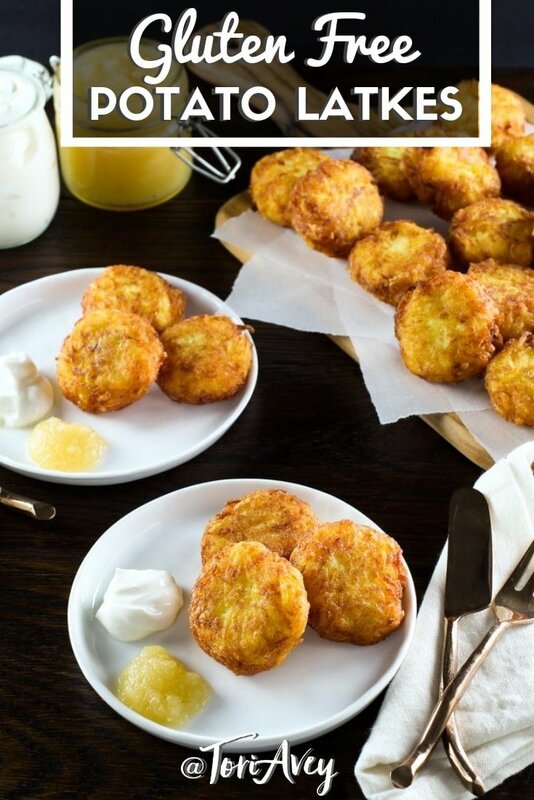 For more latke pro tips and other recipes, check out my post How to Make Crispy Perfect Latkes Every Time. You can also check out the video below. Learn to make perfect mini bite-sized potato latkes cooked extra crisp using six simple ingredients. Gluten free, grain free, dairy free, kosher, parve. 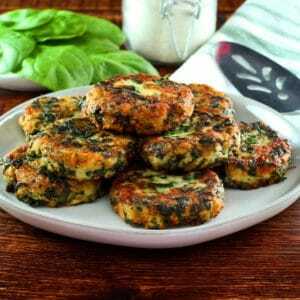 Nutrition Facts: calculated per latke with an estimated oil absorption of 1/4 tsp per latke. Recipe makes roughly 24 latkes. 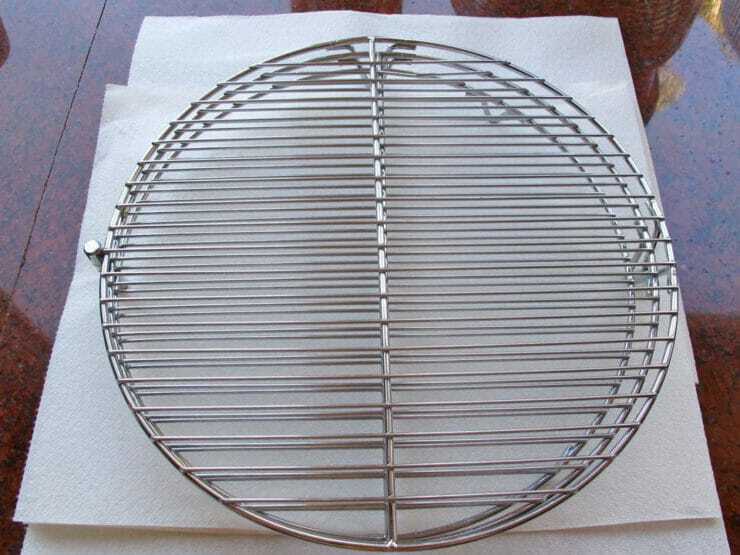 Before you begin making the latkes, place a wire cooling rack close to the area where you will be frying the latkes. Place a layer of paper towels below the cooling rack to catch excess oil. 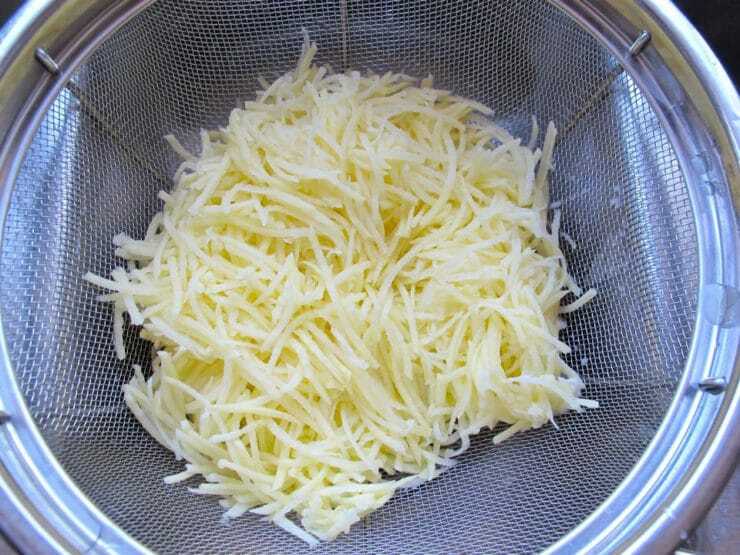 Peel the potatoes, then grate them using a hand grater or food processor shredding attachment with fine holes (small shreds). 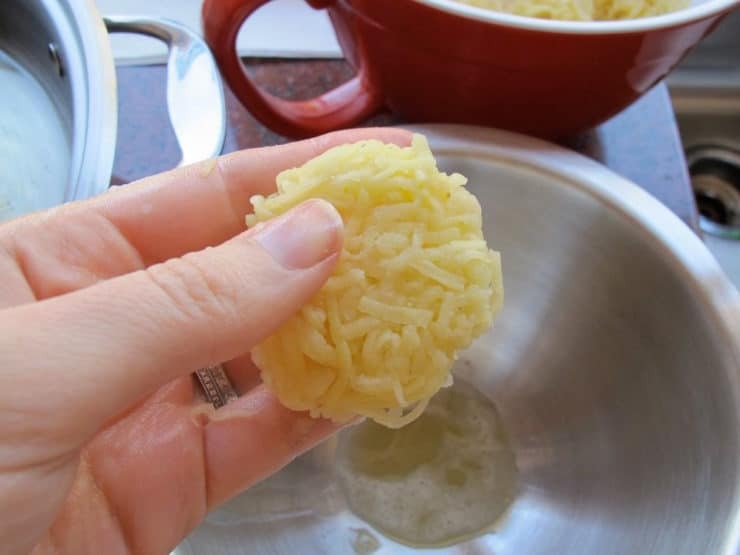 Place grated potato into a bowl and immediately cover with cold water. 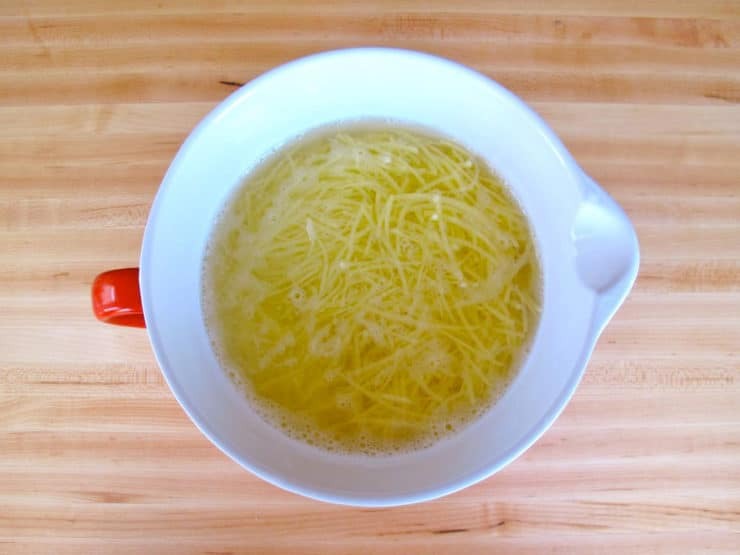 Let shreds soak for a few minutes to remove excess starch. Meanwhile, grate the onion using the same grater or attachment you used for the potatoes (fine holes for small shreds). 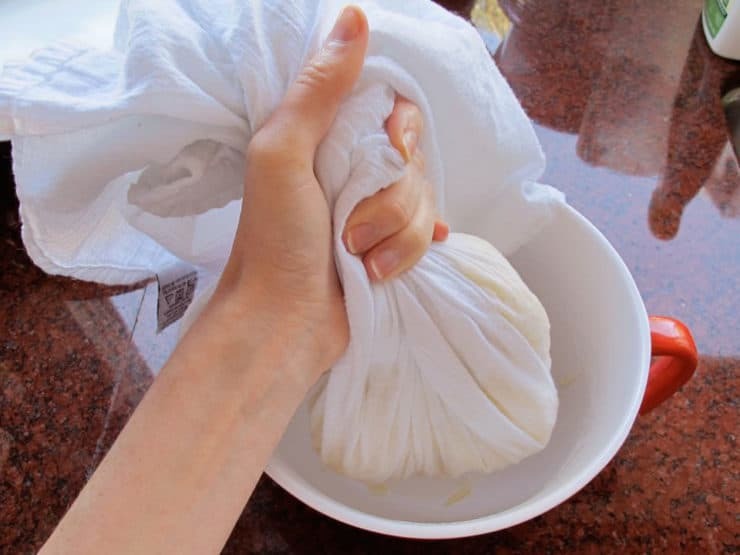 Wrap the shreds up in the cloth, twisting loose material to secure the bundle, and squeeze firmly to remove excess liquid from the shreds. Pour potato and onion into the clean, dry bowl. Stir the shreds with a fork to make sure the grated onion is evenly mixed throughout the potato shreds. While oil is heating, use the fork to stir the beaten egg, dry potato starch, salt, and pepper into the potato shreds. Take care to make sure the egg and seasonings are fully mixed throughout the potato shreds. 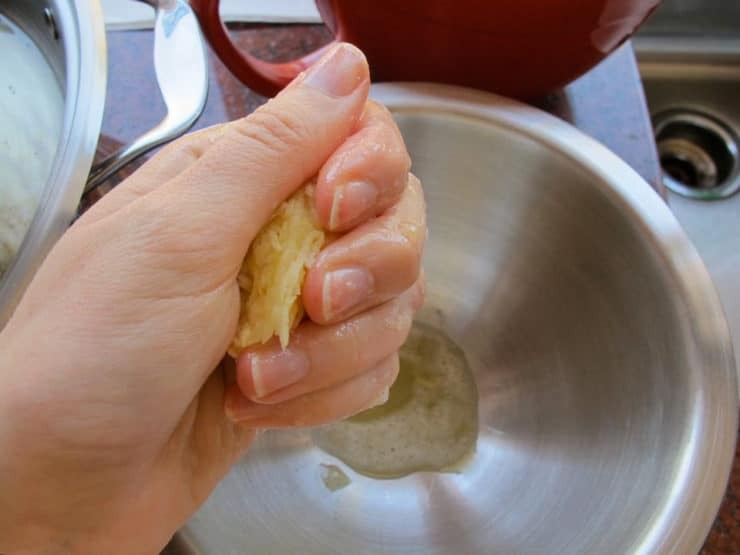 Scoop up a rounded tablespoon of potato batter and squeeze it firmly in your palm over an empty dish to remove excess liquid. Shape the batter into a rough disk. Place it gently into the hot oil. Use a metal spatula to gently press down on the latke to flatten it. The oil should sizzle but not pop when the batter hits it; if the oil jumps wildly or smokes, it is too hot. If it only bubbles weakly, the oil is not hot enough. Continue shaping the latkes in this way, using only a rounded tablespoon of potato batter for each latke. 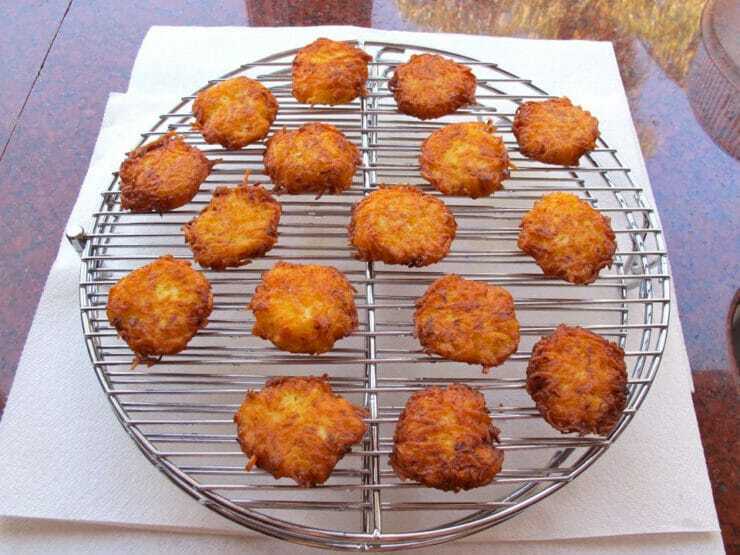 Fry in batches of 5 or 6 latkes at a time for 2-3 minutes per side until brown and crispy. Note: If your latkes aren't holding together, stir some potato starch into the mixture, 2 teaspoons at a time, until the batter "holds." 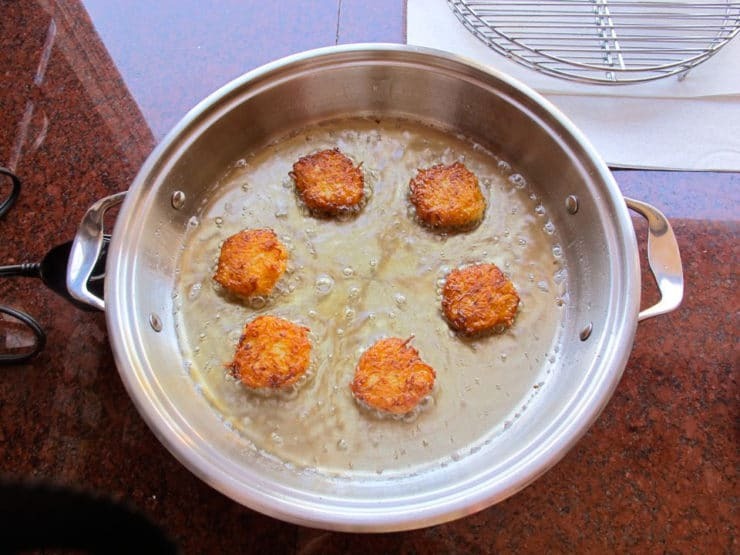 Remove the latkes from the pan using a metal spatula and place them on wire cooling rack to drain. I recommend serving latkes fresh within 10 minutes of frying them, if your cooking schedule permits. If you need to make them ahead, fry them 2 hours or less before serving. After letting the latkes drain on the wire cooling rack, place them on an ungreased, unlined cookie sheet. Leave them at room temperature until ready to reheat. Place in a 375 degree oven for about 10 minutes (7 if using a convection oven) until heated through, just prior to serving. You can also freeze the latkes for future use; they reheat nice and crispy. Serve latkes with applesauce and/or sour cream, if desired. These were great! My family loved them. I had a sweet onion, so my husband thought that really added to them. Hi Angelica! Sorry to get back to you belatedly. Tahini makes a great egg substitute in potato pancakes if you bake them. Check out this post for details. What a wonderful online site you have created!—You do Judaism, as well as culinary writing, proud! Jewish from birth myself (a liberal Reform Jewess, retired psychologist and an incurable foodie, unaffiliated with any synagogue presently), I’m old enough to be your grandmother! I admire your courage in having taken on the difficult conversion process and seen it through as an adult. You have indeed become at least as Jewish as any of us lucky enough to have been born as such. I say “lucky” because of the great richness of the tradition in which you now share. The tremendous mitzvot you do continually in providing historical links to the meanings of different culinary Jewish traditions is a wonderful gift to all of us, Jewish or not. In a world so troubled by hatreds, you are such a “bridge over troubled waters”. I became aware of your website about a year and a half ago, and hope you will continue sharing your research into the unique,varied culinary world of Judaism, as well as any other cuisine that interests you! Should you prefer not to print this and/or to respond to my own “private”(!) email address above, or not at all, given what I am sure is a hectic schedule, I fully understand. Very happy to post such a positive and embracing message. Thank you for your kind words! These were fantastic! However,I baked in oven,then a quick crisp up in microwave,I did use a little oil,so not to stick.and to celebrate Chanukah .thank you! I use metal tongs with flat ends to turn the latkes, lifting and then setting them down into the skillet oil. 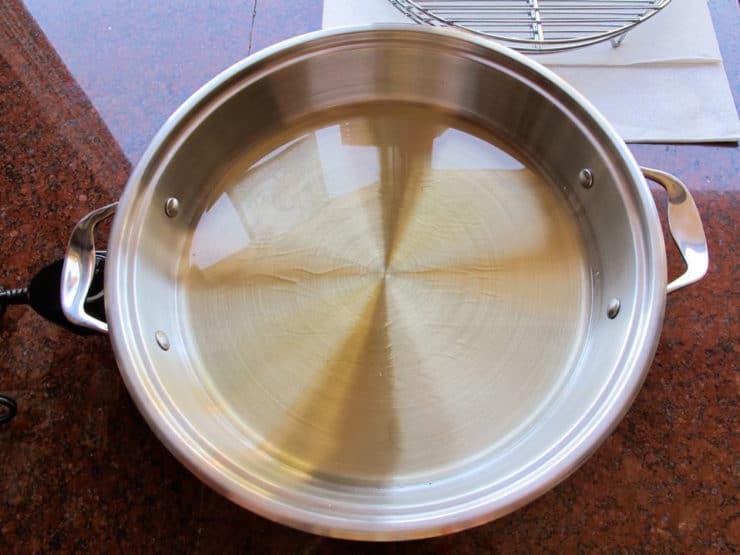 Avoids splashing hot oil. I use my candy thermometer to measure the oil temperature. Recently I was introduced to pure Avocado oil to fry with. Has high smoke point and healthier than canola and infuses no taste like peanut oil does. Made these for a Chanukah dinner party yesterday. Cooked them a few hours before and then reheated them. Because I taste tested one when they were first made, I know that they are at their best when they have just been cooked. But my guests raved about them, and gobbled them all up, so cooking them ahead of time worked out fine. So much easier to not make these when guests are arriving! Tori, sorry my last comment. U mentioned adding flour or matzo meal to the latkes mixture. I’ve noticed most latkes recipes call for apx 1/2 cup flour or matzo meal in the ingredient list. your recipe is one of the only I’ve seen that doesn’t include it (as essential.) do you prefer them w/out?? oh wait. lol i just re-read your post more carefully and realized that you had already talked about why u didn’t want matzo meal… makes them heavy and dense. so ok guess i got it. I found your blog through Elvis’ meatloaf and being an all time Elvis fan I was immediately attracted to your site so I subscribed and your recipes are great with the pictures and all. Your Latkes look amazing and I’ll try them for sure. Im having 40 people over for a latke party. I need to have these ready when they arrive. Can I prepare the mixture and form into the patties and then freeze and defrost and fry or am I better to fry and freeze and heat up. I cant be frying until the last minute but I want them to be crisp. Hi Lizm– fry them first, then freeze. If you freeze them without frying first they will fall apart. If you have a convection oven, use that to reheat them from frozen to keep them crispy. Good luck! I love your recipe! It’s very close to the one I use…also handed down from a “good Jewish girl”. Yes, there’s a story, as enchanting in its own way as the latkes are! Thanks for sharing… I have a feeling I’ll be visiting more often! They are so cute! I’ve always wondered if latkes made yukon gold potatoes would work. I just made these and they were amazing! We had over someone who couldn’t each any gluten so it was a great recipe to use. Thanks so much! I always use Russet potatoes, do you find Yukon Gold’s to be better? I also heard that they are great made in Schmaltz (which I could never do) but thought you would love, have you tried that ? 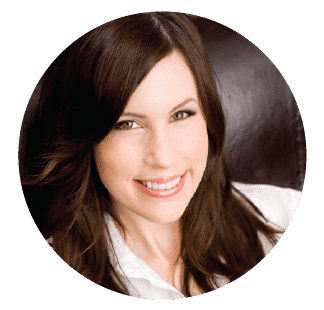 I just found your website and I love it…I know I will be checking in often! 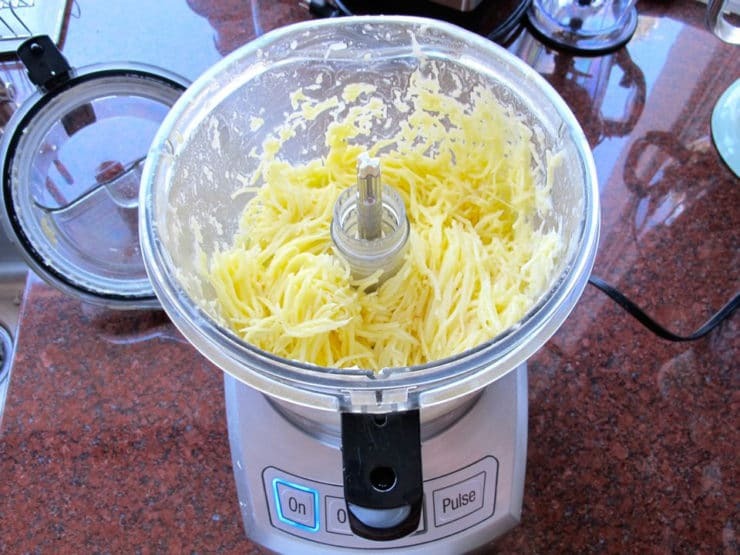 I am just wondering what kind of food processor you use to make the small spaghetti shape grated potatoes for your latkes. I need to make them exactly the way you did and would love to know….Thank you so much! I’ve made so many latkes but just picked up at least five new tips! Making them smaller is a great idea, and squeezing them before frying…well, why haven’t I been doing that until now? Yours look nothing short of perfect, and I can’t wait to try your methods on my next batch. Love your blog. The recipes are inspiring and the history is so interesting. I’ve been cooking up a latke storm over here… but the allergy-free variety! Looking making these for the next holiday party. Love these mini-latkes! Thanks for the great recipe and the pictures! You make it look so easy but I know it takes hours to post these recipes! Okay girl, I keep coming back and drooling over these so I am now making them this week. Will report back if I was successful or not. Lol! Oooh wow, these look like such a step up from the latkes I tried to make last year. I love how crispy they look. And why why why didn’t I think of using my food processor to shred those little buggers? Lol – now I know! Actually, I have always used PEI Potatoes with suc h great success!! Now I’m craving latkes! I made the Yukon gold ones last year and actually got Freshly Pressed on WordPress for the recipe. Something about those Yukon gold are too good! can’t wait to try them, they sound delicious!!!!! We made hundreds of latkes one year for our schul, we made them the day before, formed them and placed on cookie sheets and froze them, then fried them up during the chanukah party, they came out nice and crisp, and that way we had time to enjoy the party too! I love all the suggestions..esp the one about soaking the grated spuds and the wrapping and twisting in a towel. The only thing I do very different from you..I use a mini muffin pan…coat each space with spray olive oil and bake them until they are a crispy golden color..this cuts down on the amount of oil and makes for a nice presentation on the table…small round latke muffins… with a bowl of apple sauce placed in the middle of the muffins.. In a mini muffin pan, is the potato mixture pressed up the sides or just on the bottom of each cup? What temperature should they be baked at, and for how long? I’ve used many of the recipes on this site – this is the first, and sometimes only, place I look when I cook! Hi Robin, I’m so pleased you’re enjoying the site! I tried Natalie’s muffin pan idea last year, but for me the results didn’t turn out as great as I had hoped. They did not turn out nearly as crisp as traditional latkes. Natalie might have a more tips for you to make it work better (perhaps my oven temp was too low?). I think that I will stick with traditional frying in the future, since we only make these once or twice a year. What temp should convection oven be set on & what’s (7 if using a convection oven) mean? One way to keep the potatoes white is to swcatter ice cubes among them! Also, I have always drained my potato latkes on brown grocery bags & they’re always a hit! YUM!!! As one of the attendees at the early Thanksgiving meal, I can attest that these were fantastically good! I’ve always loved latkes but yours look so crispy and delicious! I would end up eating the whole plate on my own. Looks amazing! Tori – these look wonderful! I love latkes. 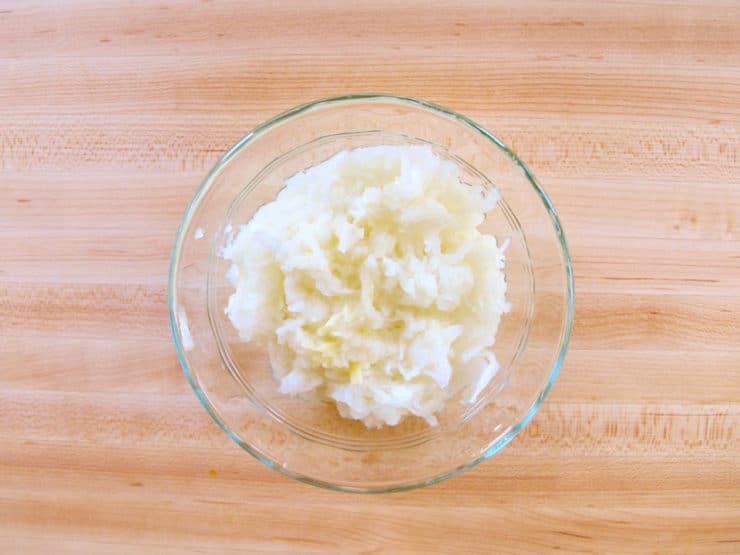 It’s funny – I always use grated onion in my potato salad…I guess grated onion and potatoes are friends! I love the tip about soaking them. These look so good. I’ve never made them myself. Think I must try. 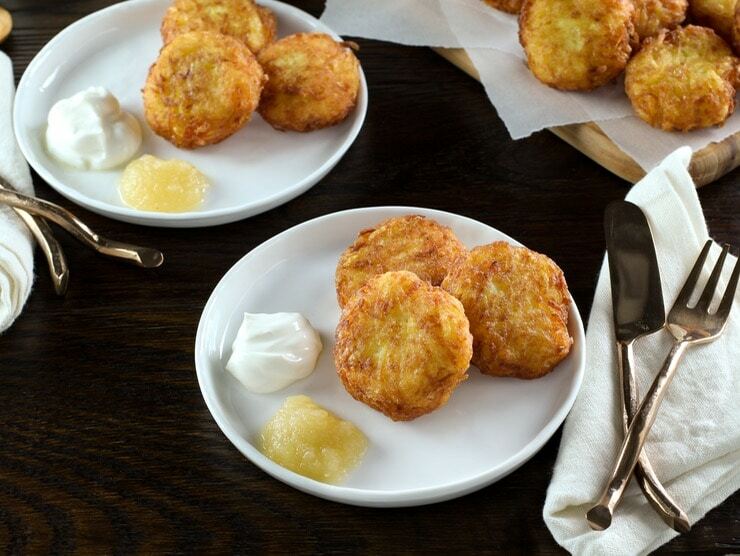 Your latkes are perfection, Tori! So perfectly crispy! I bet they are delicious! What adorable latkes! I love them all year round too- and Hanukkah will be here before we know it! Oh my gosh they were melt in your mouth delish. Chrispy cruchie just the way I love them w/ applesauce cuz I can’t have the sourcream. I have never made these before but after reading this, it looks like something I want to try. Your post is very clear, informative and has some great tips. 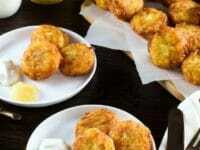 The latkes look very addictive and tasty, no doubt you have done this more than once! Great post Tori! yummm! these will be in my menu for tomorrow for sure. They look so good that I can almost smell them yummm! The twisting of the cloth is key to remove the moisture. Never thought about soaking the potatoes to remove the starch. Good one Tori. Wow, those look fantastic! Most of the potato latkes I’ve eaten were mushy, not crispy. Thanks for sharing tips on making them crispy. I have russet potatoes and onions standing by. I look forward to trying these. Can I make a batch to freeze after cooking? Hi Faythe and Danielle! I don’t usually like to freeze latkes, since they never reheat quite as crisp, but it certainly can be done. 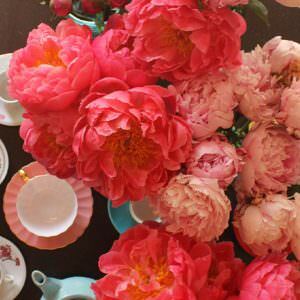 Freeze them with wax paper in between layers (to keep them separated, otherwise they’ll stick together). Reheat them in a single layer on a bare cookie sheet in the oven (per the instructions in the recipe) until heated through. Use the convection setting on the oven, if you have one. When hot, drain them for a couple of minutes on a cooling rack or paper towels and serve. This recipe sounds great! I’m already thinking ahead to my Hanukkah party. Is it possible to make these ahead of time and freeze them then reheat them?